Million thanks to Benchmark and Nipun who helps me with OET preparation. I have successfully passed my english which only took me a 4-week OET class at Benchmark to prepare. I was always received immediate feedback and extra supports from Nipun (our tutors). Now i feel so relief because with this result, i can apply for my registration as a nurse and more importantly, apply for my PR. Thank you once again Nipun, without you, my dream may not come true. The times they are changing! As you know, the OET exam changed in September 2018 to OET 2.0. This change can seem daunting but the main thing to remember is that the tests have not become harder.Essentially, it is just their format that has changed, so there is nothing to worry about! Part B is where the main change takes place. There will be six short texts (100-150 words each) set in workplace contexts such as emails, policy documents or manuals. You will be assessed on your ability to understand the keys points and messages conveyed. The answers will be in multiple choice format with 1 question per text. You will need to understand what type of text you are reading, and the vocabulary used. You then just have to identify the correct answer for the question related to the text. Not so hard really! Part B and C will be taken in the 45 minutes that were originally given for part B. Even before the changes, a high proportion of OET candidates failed to get their registration as a result of failing to achieve their grades in the reading module. Many of them struggled as they did not have the right materials and samples to practice or they prepared using a reading test that did not meet OET exam standards. Our sample reading practice tests really work, and you will see a significant improvement in your accuracy after using these reading tests. Thesample tests for the OET 1.0(if such a term ever existed) have worked for hundreds of OET test takers who went on to pass the exam with flying colours!Now, we have completely revised the reading materials so that they are suitable for the new test format and we have no doubt that the results will be equally as impressive, if not more so this time around. We engaged industry leading professionals from healthcare and ESL training to ensure the reading tests give you enough exposure to the exam-like difficulty. Our reading tests have modernized! To replace the PDF downloads, we will now offer practice reading tests that can be accessed and completed on your computer, laptop or tablet. This is a much more flexible system, giving you the opportunity to practice your OET reading skills any-time, wherever you are. Once you have purchased the tests, all you will have to do is log in and get started! What’s more, there are built-in timers for each section to simulate conditions similar to the real OET exam. The format of the tests is exactly the same as in the OET 2.0 exam, covering part A, B and C. The level of competency tested is also parallel, as is the vocabulary used. All of the reading topics are related to the medical field and are appropriate for all medical professionals, from dentists to nurses, pharmacists to surgeons, and are relevant and highly engaging. See our excellent package and offers below. *Please use any email account EXCEPT Hotmail, Live or Outlook. We are working to resolve the mail server issues with Hotmail, Live and Outlook at the moment. The tests can be practiced more than once. Practice makes perfect as they say! Everybody knows this saying, but it really is the key to success in the OET exam. 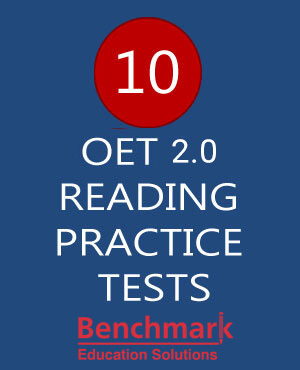 Our high quality OET 2.0 compliant reading tests samples will help you to reach that perfection on exam day.Whatever field of health-care you are in, be it nursing, medicine, physiotherapy or dentistry, we can give you the support you need to be competent and confident when it comes to the OET reading test. There is no need to be scared of the changes to the OET tests, all you need to do is to make sure you are prepared with all the tips and that’s where we come in. Don’t leave it until the week before the test, have a look at our updated and excellent quality materials and get started NOW!